The idea was first discussed between Madhya Pradesh Chief Minister Shivraj Singh Chouhan and Prime Minister Narendra Modi at the Global Investors Summit in Indore last year. The plan is to invite investment for developing, a safari road network covering at least 70 per cent of the area, and cameras at waterholes and artificially-built tiger dens for live streaming at restaurants inside such properties. The Central Government is actively considering a proposal to amend the Wildlife Act and convert large tracts of degraded forests to private concessions meant for high-density tiger tourism. 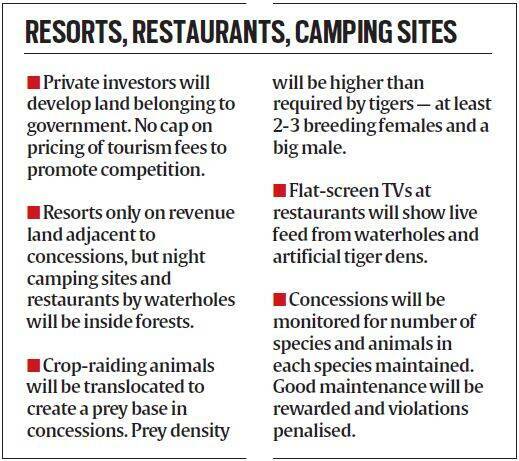 The plan is to invite investment for developing parcels of 20-50 sq km forestland as concessions under the Public-Private Partnership (PPP) model with fences, a safari road network covering at least 70 per cent of the area, and cameras at waterholes and artificially-built tiger dens for live streaming at restaurants inside such properties. The Environment Ministry is currently scrutinising the technological and legal aspects of the proposal, which was discussed at a high-level meeting in August. “This is a policy matter. Yes, we had initial discussions but no final decision has been taken. Now the issue is with the division that deals with forest policy in the ministry,” said Vinod Ranjan, additional director general (wildlife). The idea was first discussed between Madhya Pradesh Chief Minister Shivraj Singh Chouhan and Prime Minister Narendra Modi at the Global Investors Summit in Indore last year. Subsequently, ‘private investment in forest and wildlife conservation’ was placed as the first item on a list of proposals sent by Chouhan to Modi on October 17. In his letter, Chouhan proposed that the Wildlife Protection Act, 1972, be suitably amended to allow private investment, arguing that the time has come to free wildlife from the “absolute hold” of the state, which is constrained by financial limitations. The Environment Ministry then sought a concept note on the project from the Madhya Pradesh government, which was handed over early this year. The Indian Express has examined the concept note and other official documents related to the proposal (see box), which indicate that the Government is expected to share a part of the cost as Project Development Expenditure (PDE) and Viability Gap Funding (VGF), since trophy hunting — the mainstay of such concessions abroad — is not permitted in India. The concept note, however, is silent on obtaining the consent of local communities under the Forest Rights Act. It states that 10-20 per cent of the forest area under each project can be “managed” to meet the community’s requirement of firewood and fodder. This should suffice as concessions will create jobs for locals and also reduce crop raiding, it suggests. The note claims that such concessions will rejuvenate degraded forests, lessen the tourism pressure on existing tiger reserves, serve as tiger corridors or buffer to adjoining sanctuaries, reduce crop damage, and create jobs for locals. The United Nations Environment Programme (UNEP) has defined a degraded forest as “a secondary forest that has lost, through human activities, the structure, function, species composition or productivity normally associated with a natural forest type expected on that site… and maintains only limited biological diversity”. Incidentally, the Finance Ministry had sent a letter to the states on December 11, 2014, backing private investment in zoos. It is now being argued within the government that such investment in forest land and wildlife management will be more helpful to conservation.